Interregional trade has been relatively neglected by most trade analysts. A dearth of data has limited formal explorations of interregional trade but the magnitudes of the volumes revealed suggest that greater attention should be directed to this form of connectivity between economies. The chapter begins with a review of the theory and tests of international trade theory and its link to some of the ideas that form the basis of the New Economic Geography. Then, some alternative approaches to the measurement of trade are examined, especially the role of intra-industry as opposed to inter-industry trade, vertical specialization, trade overlap and spatial production cycles. Thereafter, attention is addressed to the interregional impacts of international trade. Apart from the significant growth rate, the most notable feature of the news release is the absence of any mention of the growth of interstate or interregional trade. In contrast to international trade data, which are often released on a monthly or quarterly basis, data on interregional trade are often not collected at all or issued only infrequently. Hence, Gov. Blagojevich and many others have come to interpret regional trade as regional international trade, i.e., flows of goods and services from a region in one country to other countries, with trade between regions within the same country being ignored. This is surprising in view of the fact that interregional trade is free of many of the restrictions imposed on international trade. Within a country, there are likely to be smaller cultural differences, lower freight costs, a uniform currency and similar institutions. Consequently, interregional trade is most likely relatively more important than international trade. This chapter will provide analyses of the importance, structure and measurement of interregional trade. The next section will provide a review of international trade theory with a focus on its relevance for regional trade, i.e. with a focus on the difference between trade with and without trade barriers. 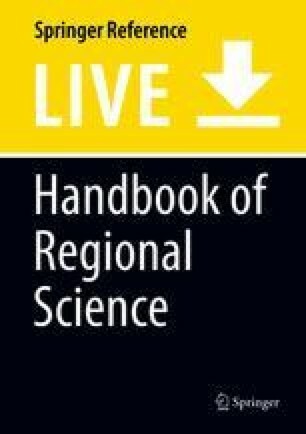 The following two sections will examine some analysis of the structure of interregional trade using a variety of methods for a variety of countries. The final section provides some summary comments and challenges. It is clarifying to start an overview of traditional trade theory by comparing it with traditional growth theory. Both are based in neoclassical economics, which means that they assume flexible prices, full competition and substitution between inputs. Growth theory explains regional time paths of output/capita based on regional growth of factor inputs, including net in- or outflows of capital, labor and technology, while it assumes regional sectoral specialization to be determined exogenously. Trade theory, however, explains regional sectoral specialization from technological and factor endowment differences, and concentrates on comparative static analyses of social welfare with and without trade barriers, but it does not generate time paths of per capita output. Besides traditional trade theory, we summarize the so-called new trade theory and show how New Economic Geography is a direct descendant of it. There is a host of factors that is put forward to explain the commodity pattern of interregional and international trade. David Ricardo argued in the early nineteenth century against the conventional wisdom of that time, which said that absolute advantages in costs determined which commodities a country could export. In fact, Ricardo showed that even countries with an absolute disadvantage in terms of the unit production cost of all its tradeable products may profitably engage in international trade without needing to protect their high cost domestic industries. He argued that even such countries must have a comparative advantage in the production of at least some goods, where comparative advantage is defined as the lower amount of other goods that has to be forsaken, compared to other countries, if the country at hand specializes in the production of that good. 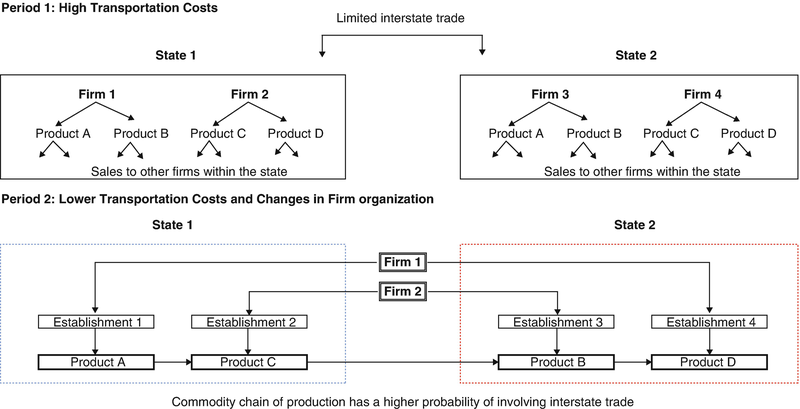 Figure 1 summarizes his argument in a neoclassical setting with two countries East (E) and West (W), two products Steel (S) and Textiles (T), one factor of production Labor (L), and constant returns to scale. Figure 1 considers the case in which both countries are equally large (i.e. E and W have the same amount of labor available) and both have the same consumer preferences for S and T, i.e. E and W have the same social indifference curves (SICs), indicated by the bold convex, non-linear lines in Fig. 1. The slopes of these SICs indicate the amount of T that the consumers in East and West require to stay equally satisfied when loosing one unit of S.
As there is only one factor of production that operates under constant returns to scale, the production possibility frontiers (PPFs) of both East and West are linear, as indicated by the bold straight lines in Fig. 1. For each country, the slope of its PPF indicates the amount T that the producers are able to produce more if they produce one unit less of S. The PPF of West lies entirely above that of the economically equally large East, which indicates that West has an absolute advantage in the production of both S and T. The PPF of East, however, has a steeper slope, which indicates that it has a comparative advantage in the production of Textiles. The equilibrium is reached where the highest SIC just touches the PPF of the country at hand. When there is no trade between East and West, the left hand side of Fig. 1 shows that this set of assumptions leads to an autarky equilibrium with an higher level of consumption = production of both S and T in West, and thus to a higher level of welfare in West, as indicated by its higher equilibrium SIC. Also note that the form of the shaded consumption = production rectangles of East and West indicates that the consumers in East consume relatively more Textiles (i.e. CTE/CSE > CTW/CSW). The explanation is that East has a comparative advantage in producing Textiles, and thus a higher domestic price of Steel to price of Textiles ratio (PS/PT), indicated by the higher slope of its PPF. When all trade barriers, including transport cost, are removed, the difference in the domestic price ratios induces firms in East to export Textiles and firms in West to export Steel until the domestic PS/PT ratios in East and West converge to a value in between the two autarky price ratios shown in the left part of Fig. 1. This uniform free trade equilibrium price ratio is shown by the slope of the two parallel dashed lines in the right part of Fig. 1. The lower of the two dashed lines indicates the equilibrium consumption possibility frontier (CPF) for East, which starts at the maximum possible production of Textiles by East (YTE). Given the equilibrium PS/PT slope of its CPF, East will consume CTE of Textiles and export the remainder of its textiles production to West (i.e. XTE = YTE – CTE), which allows East to import the amount of steel it desires at this free trade PS/PT ratio. The higher of the two dashed lines indicates the equilibrium CPF of West, which starts at its maximum possible production of Steel (YSW). Given its CPF, West will consume CSW of Steel and export the remainder of its steel production to East (i.e. XSW = YSW – CSW). In this two-region case, the exports of East equal the imports of West and vice versa. Hence, the two shaded trade triangles have exactly the same size and form. Note that this free trade equilibrium leads to a higher level of welfare for both East and West, as argued by Ricardo, but West still has a higher level of welfare as it is able to consume absolutely more Steel and more Textiles. One of the criticisms of the Ricardo model is that it presents no explanation for the productivity differences between East and West. A more serious criticism is that it seems to predict that each country will produce and export only one product and import the remaining products that it wishes to consume with the revenue of that single export. Reality, however, shows that most countries export a whole range of products. This criticism is not entirely correct as the production capacity of many smaller countries is limited, which reduces the import possibilities of the larger countries, as indicated by the horizontal section of the higher of the two dashed CPFs in the right part of Fig. 1. Consequently, larger countries need to produce more tradeable products than the single one they export. In terms of Fig. 1, this will lead to a corner solution for West at the nod of its consumption possibility frontier. Note that even in a free trade situation with no interregional differences in tastes, technology, or factor endowments, the existence of transportation cost with increasing returns to transportation may result in commodity compositions of interregional trade that are opposite to those predicted Ricardian model (see Cukrowski and Fischer, 2000). Still also in that case, additional gains from trade may emerge from the reductions of transportation costs. See Krugman et al. (2011) for a further evaluation of the Ricardian model. Above, we have formulated the Ricardian model in terms of a neo-classical trade model, although it is usually considered to be part of the classical tradition in economics (e.g. van Marrewijk 2002). The real neo-classical trade model was developed independently by Heckscher and Ohlin in the 1920s (hereafter called the HO model; see Leamer 1995 for a review). It also has two countries, say E and W, and two products, say S and T, which are both produced under constant returns to scale. In contrast to the Ricardian model, the HO model assumes that production technologies are identical across countries and that production requires two factors, say Capital (K) and Labor (L), instead of just one. Both factors of production operate under diminishing marginal returns, which means that the production possibility frontiers of both East and West are concave, non-linear curves, as shown in Fig. 2, instead of the straight PPFs in Fig. 1. When all trade barriers, including transportation cost, are removed, the difference in the domestic price ratios induces firms in East to start exporting Textiles and those in West to start exporting Steel until the domestic PS/PT ratios converge to a common free trade equilibrium price ratio. The two parallel dashed lines in the right part of Fig. 2 represent this equilibrium price ratio. In contrast with the Ricardian model in Fig. 1, the equilibrium consumption possibility frontiers (CPFs) of E and W of Fig. 2 do not start where the production possibility frontiers (PPFs) join the horizontal and vertical axes, but start where the PPFs equal the slope of the free trade price ratio. Consumers in East (West) consequently move away from consuming the formerly cheap Textiles (Steel) towards consuming more of the now cheaper, partly imported Steel (Textiles) until they end up at their highest indifference curve possible. The right part of Fig. 2 shows that, under free trade, East exports the difference between its now larger production and smaller consumption of Textiles (i.e. XTE = YTE – CTE). Analogously, West exports the difference between its now larger production and smaller consumption of Steel (i.e. XSW = YSW – CSW, see the right part of Fig. 2). With these exports, E and W finance their import against the free trade price ratio of the two CPFs. This is indicated by the two shaded trade triangles. With only two regions, these have exactly the same size and form (like in Fig. 1). Again, both countries benefit from free trade, as indicated by reaching a higher social indifference curve (SIC) when moving from the left to the right part of Fig. 2. In contrast to the Ricardian case, however, both countries still produce both goods, be it in different proportions than in the autarky case. This implies that both Capital and Labor, in both E and W, have to move from the sector that shrinks because of competing imports, to the sector that grows as it becomes the exporting sector. This interindustry production factor mobility, of course, has consequences for the remuneration of both capital and labor (not shown in Fig. 2). Under autarky, Labor in the labor-abundant East will receive relatively low wages (PL), whereas Capital will receive a relatively high rate of return (PK). The reverse will apply to West. Under free trade, relatively little Labor comes free from the shrinking Steel sector of East, while relatively much is needed in its growing Textiles sector. In contrast, relatively much capital comes free from its shrinking S, while relatively little is needed in its growing T. Consequently, in East PL will increase, whereas PK will decrease. As a reaction to this decrease in PK/PL, both the T and S sector in East will substitute away from using Labor toward using relatively more Capital, which partly counteracts the raising wages and declining PK. Note that the decrease in the domestic PK/PL ratio in East is caused by the decrease in its domestic PS/PT ratio. Hence the prices of the production factors move in the same direction as the prices of the products that use them intensively. The reverse process in West will lead to a reverse result. Under free trade, its domestic PS/PT ratio will increase, which will draw both K and L from its T sector to its S sector, which will require its PK/PL ratio to rise too. Hence, relative product prices converge under free trade and relative factor prices follow. In fact, Paul Samuelson proved in the 1940s the factor price equalization (FPE) theorem: when under neoclassical conditions (i.e. identical technologies, concave PPFs and convex SICs) both goods remain being produced in both countries, the complete equalization of product prices under free trade will lead to a complete equalization of factor returns (see van Marrewijk 2002, ch. 5). The Heckscher-Ohlin model of international and interregional trade is thus a full general equilibrium model that predicts sectoral production, consumption, imports and exports, and the prices of products and production factors. Its prediction of factor price equalization, however, only partly comes true in reality, whereas its prediction of the composition of exports (namely that countries abundant with capital will export goods that use capital intensively) has been refuted many times. This outcome became known as the Leontief-paradox, after Leontief who first used the input-output model to measure the factor content of trade (see Foster and Stehrer 2012, for an overview of these studies). In fact, Leontief (1953) found that US exports embodied relatively more Labor than US imports, whereas the US was considered to be Capital-abundant. Trefler (1995) showed that part of the Leontief-paradox may be explained by adding the Ricardian assumption of different technologies to the HO model. Others have shown that adding natural resources and different levels of human capital improve the prediction of the HO model. However, even the extended HO model still predicts far more embodied trade in the abundant factors than is found in reality. This became known as the missing trade problem (Trefler 1995). Relaxing its restrictive assumptions thus improves the performance of the HO model. However, the core assumption of free trade does not hold in international trade. Even the trade between EU-countries is still hampered by differences in legal systems, languages and business cultures. The assumption of free trade, in fact, fits much better to the conditions under which interregional trade within one country operates. The same applies to the assumption of identical production technologies and consumer preferences, and the assumption of zero transport cost. Hence, it does not come as a surprise that extended versions of the HO model perform much better when tested on interregional trade (see Davis et al. 1997, for Japanese regions). There is one core assumption of the HO model, however, that fits better to international than to interregional trade, namely the immobility of factor endowments between spatial units. The interregional migration of production factors K and L and the interregional mobility of products S and T have much in common. Both are motivated by price ratios (PK/PL and PS/PT) that move in the same direction when mobility barriers are removed. Both also reinforce each other’s contribution to the interregional FPE of wages and capital returns (see Borts and Stein 1962). The HO model’s prediction of sectoral specialization, however, is undermined by the interregional mobility of K and L, as it equalizes factor endowments across regions. This takes away the comparative advantage of the regions and thus undermines one of the driving forces behind what is known as interindustry trade, namely why regions import and export different kinds of products. The Ricardian model and the HO model combined and extended, thus provide a good approach to understand interindustry trade. Both models, however, are of no help to understand why, especially, developed countries and regions import and export the same type of goods, i.e. why Germany exports as well as imports cars to and from Japan. This type of trade is known as intra-industry trade, and its explanation requires what is known as new trade theory. where Xir stands for the exports of product i by region r and Mir for the imports of i by r. Brühlhart (2009) shows that the weighted average Grubel-Lloyd index for high income countries grew from 11% in 1962 to almost 38% in 2006, whereas it remained at a level of around 1% for the poorest countries in that sample. To explain this increasingly important phenomenon of intra-industry trade, two strongly related core assumptions of neo-classical economics have to be dropped, namely that of constant returns to scale and that of full competition, while the assumption of homogeneous products has to be replaced with that of heterogeneous products and love of variety. Introducing increasing returns to scale may simply be done by introducing fixed costs that are independent of the scale of production along with marginal cost (MC) that are constant per unit of output. This makes average cost (AC) a downward sloping, concave function of output, approaching MC at higher output levels, as shown in Fig. 3. Introducing imperfect competition, however, opens up a whole array of options, from pure monopoly via duopoly and oligopoly, either with or without collusion, all through to monopolistic competition. New trade theory, consequently, consists of a whole array of different models (see Krugman et al. 2011, for an overview). We will only use the two most extreme models, and thus simply move from a pure monopoly under autarky to monopolistic competition with many varieties of the same product produced under free trade in many different countries. To start, assume a single monopoly that operates in a fully protected market, say the Trabant car company in the former German Democratic Republic (GDR). This implies that the average revenue (AR) of the Trabant company in the left part of Fig. 3 equals the market demand curve D for cars in the GDR. Assume that Trabant was allowed to maximize its profits, then it would have increased its sales of cars by lowering its price until its dropping marginal revenue (MR) would just equal its constant marginal cost (MC), as indicated in left part of Fig. 3. This would generate a maximum monopoly profit, equal to the difference between the monopoly price (PM = AR) and average cost (AC) multiplied with the number of Trabants sold at MR = MC (i.e. QM). This maximum profit is indicated by the shaded rectangle in left part Fig. 3. In the interest of its inhabitants, however, the GDR government most likely would have ordered Trabant to further decrease its price until it just equaled average cost (PS = AC = AR), at which social price Trabant would not have made any monopoly profits, but would have been able to produce and sell many more cars (i.e. QS). Next, consider the case in which East-Germany joins the European Union. Then Trabant would have been confronted with the competition of many more car producers from many more countries. Of course, some former East Germans would have continued to buy Trabants, because that was precisely the car they wanted to have anyhow, but the majority of them would have turned to different types of cars that better suited their taste. This means dropping the assumption of a single homogenous product for the assumption of heterogeneous products with a love of variety. Trabant would have lost a considerable amount of domestic sales, but at the same time it could have expanded its production by selling to new customers in the Rest of the EU. In terms of market forms, the former monopolist now has to operate in multiple markets with many competitors, each producing a different variety of car, i.e. it has to operate in a market characterized by monopolistic competition. In that market, the demand for Trabants is much more elastic to price changes, as indicated by the rotation of the demand curve in the right part of Fig. 3. In the new free trade equilibrium, more Trabants might have been sold, but at a lower price, which would mimic the case in which the government would force the monopoly price PM down to AC. The monopolistic competition model further assumes free entry and exit of firms, which will move the demand curve for Trabants down until AC = AR. In reality, we saw a closing down of the Trabant car factories, probably indicating that their average cost was too high for their new much more price-sensitive demand. The first two terms of Eq. (2) represent the CES utility function, with different ci and a love of variety parameter ρ. To better understand the working of this love of variety, assume that all varieties i are consumed in the same amount c = ci, i.e., this consumer buys TVs that all have the same size 1.0, instead of TVs that have sizes of say 1.1, 1.5 and 1.9. Then the utility Uc from consuming TVs can be decomposed as indicated by the last two terms of Eq. (2). They show that the increase in utility is larger than the increase in resource use due to consuming more TVs. Mathematically this reflects that a single TV that is chosen from a large variety of TVs delivers a larger satisfaction than when there is only a single type of TV for sale. Equation (2) can be used to compute the welfare benefits of free trade under monopolistic competition on the demand side of such markets. Further benefits occur on the supply side due to lower AC, because of the larger production volumes under free trade (compare the left part with the right part of Fig. 3), and because of productivity gains and innovation due to competition. The closing down of some firms, like that of Trabant, however, shows that the economic and social cost of transition may be sizeable for at least some regions/countries. Besides, several cases of less usual combinations of assumptions also lead to negative impacts of free trade, such as the case of the infant industry argument and unfortunate path dependencies (see van Marrewijk 2002; Krugman et al. 2011, for further discussion). One last, major benefit of free trade has not been discussed yet. The love of variety effect of Eq. (2) not only applies to final goods, but also applies to intermediate goods and services used by firms. In that case, Eq. (2) mathematically reflects that, say, having to buy with one local, general purpose public relations (PR) firm delivers a less effective advertisement campaign than when the purchasing firm may choose between a host of specialized PR firms, normally available in big urban agglomerations. These matching benefits of thick markets not only apply to intermediate input markets but also apply to thick local labor markets. Besides these matching effects, big urban agglomerations also benefit from pecuniary external economies of scale, such as the lower risks and lower cost of outsourcing, and pure technical externalities, such as the free exchange of, especially, tacit type of information leading to more innovation. Not surprisingly, therefore, the above monopolistic competition variant of new trade theory may be considered as the forerunner of New Economic Geography (NEG). In fact, simplified to its bare essentials, the first core model of NEG (Krugman 1991) only adds the mobility of Labor to this variant of new trade theory (Krugman 1979). The above theoretical expositions have been expanded to include additional dimensions of trade, such as the links between trade and production chains. Hummels et al. (1998) introduced the concept of vertical specialization of production to explain at least part of the empirical finding that economies were becoming increasingly integrated. For vertical specialization to occur, Hummels et al. (1998) postulated three conditions: (i) the good must be produced in multiple, sequential stages; (ii) two or more countries must specialize in some but not all stages and (iii) at least one good in its various processing stages must cross an international border more than once. In essence consider a good produced in a country for export that uses an imported component (see the left side of Fig. 4). Translated to the interregional system, vertical specialization would be similar with an imported component from region r being used in the production of a good in region s that is exported to region q. This concept feeds into several related issues; how is it linked to outsourcing, fragmentation, hollowing out and spatial production cycles? Outsourcing can accompany vertical specialization when a firm that formerly used domestic inputs decides to source them from another country. However, the firm using the now imported inputs would have to export the good to qualify as being engaged in vertical specialization. Fragmentation of production (see Jones and Kierzkowski 2005) is a process that might be considered a necessary but not a sufficient condition for vertical specialization to take place. Referring to Fig. 5, during an era of high transportation costs, firms organized production in such a way that a larger volume of products and intermediates were often produced within the same plant or within plants located in the same vicinity. As transportation costs decreased, firms were able to exploit economies of scale by fragmenting production into more specialized components that were associated with specific geographic locations. The production chain thus spread across many economies (regions or countries); if the three characteristics of vertical specialization were met, then fragmentation would lead to vertical specialization and trade would come to be dominated by intra-industry trade. In an economy such as Japan at the national level (Okazaki 1987) or Chicago at the regional level (Hewings et al. 1998) the process of fragmentation is often accompanied the hollowing out of economies. This process implies that intra-economy dependence decreases and inter-economy dependence increases. The striking evidence for this are the ways in which both international and interregional trade have grown at rates exceeding domestic production. The final piece of the picture may be offered by the notion of spatial production cycles. Here Sonis et al. (2002) expanded the notion of vertical specialization by exploiting the ideas of feedback loops (see right part of Fig. 4), This approach explores the possibility that the exported good from the vertical specialization process may end up undergoing further processing until a finished good is produced that may be being exported back to the country in which the whole process started. Although there have not been any attempts to measure the degree of vertical specialization in interregional trade, a companion approach by Munroe et al. (2007) attempted to measure the degree of intra-industry trade between the Midwest states of the US. While vertical specialization focuses on the import content of exports, an important subset of this trade would be accounted for by flows between firms in the same broad industrial category. In the traditional HO model of international trade described in Sect. 2, trade is driven by differing factor endowments between regions. The HO model cannot adequately explain the large degree of trade in similar goods taking place among similar economies. If intra-industry trade (hereafter, IIT) is at odds with the more traditional HO framework of comparative advantage, one must first grapple with the determinants of such trade. Stone (1997) separates the determinants of IIT into two categories: industry-based determinants, and regional characteristics. The industry-based determinants include: product differentiation, scale economies, industry specific cost structures, and transportation costs. Regional determinants include macroeconomic characteristics, such as income level and relative capital/labor ratios. It has been assumed that IIT will increase as income differences decrease because demand structures become more similar, with fewer differences in factor endowments, and growing average incomes. Within the IIT theoretical literature, there are differing assumptions regarding the type of product differentiation within an industry that leads to IIT. The three general types of differentiation include horizontal product differentiation (differences of variety), vertical product differentiation (differences of quality), and vertical integration of the production process itself (trade in intermediate goods). Krugman (1991) has championed the case for horizontal differentiation leading to increased IIT, using Eq. (2), the Dixit-Stiglitz equation; his contributions add the fact that consumer preferences become more diverse leading to greater product differentiation by type or variety. As each region specializes in a certain variety of a good, incentives for trade arise. This model is most applicable to the study of trade among highly developed economies, with a predominance of trade in capital-intensive goods and a high level of technology. Intra-industry trade between economies with dissimilar endowments and levels of technology, however, is most likely the consequence of the international fragmentation of value chains. Thom and McDowell (1999) argued that intra-industry trade takes two forms: horizontal and vertical. Horizontal intra-industry trade is associated with economies of scale and occurs when products are differentiated and consumers express preferences for product variety, as in the Dixit-Stiglitz formula. Vertical intra-industry trade, on the other hand, is similar to interindustry trade in that it exploits comparative advantage and specialization; not between different industries as with interindustry trade, but within the same industry as trade in different parts and components. Price (2001) noted two trends in the fragmentation process: trends in the spatial dimension associated with economies becoming more global (in part reflected by the hollowing out phenomenon noted earlier), and trends in the specialization dimension where firms (and particularly plants) are becoming more specialized because of the enlarged market created by global demands. To provide a brief empirical illustration, an examination of US Midwest interregional trade was conducted using the Grubel-Lloyd (GL) IIT index, see Eq. (1), to measure the amount of trade overlap. A value of one would imply perfect trade overlap, and a value of zero would imply perfect specialization. Comparing GL indices for the five Midwestern states is a good point of departure for understanding trade flows within this region. Table 1 summarizes these findings. For each of the five states, five industries with the highest (trade overlap) and lowest (trade driven by industry specialization) GL indices are reported. In addition, the state of destination is reported, where RUS stands for “Rest of United States”. As predicted by new trade theory, some of the more “high-tech” industries appear in the column with the highest trade overlap; e.g., fabricated metal, transportation equipment, machinery, and food and kindred products (agricultural processing). Conversely, in the column reporting the most specialized trade, some industries appear that are more natural-resource based, or have lower levels of high-tech production methods; e.g., coal, textile mill products, pulp and paper products, metallic ores, and furniture and fixtures. However, these results are somewhat equivocal. In a few cases, an industry that exhibits a high level of trade overlap for one state is specialized in another state; e.g., photographic and optical instruments, leather and leather products, and clay, concrete glass and stone. This finding perhaps points to the complexity of these trade flows; possibly trade driven by both intra-industry specialization and competitive advantage occurs. Another interesting finding is that for all states, most of the IIT is directed to other states in the Midwest. For Illinois, Ohio and Wisconsin, more of their trade to the Midwest is driven by IIT, while their trade to states outside the Midwest is predominantly specialized. This observation underscores the importance and interdependence of trade flows among states within this region and further suggests that agglomeration effects are being manifested at the multistate level rather than for individual metropolitan or state economies. It should be noted that several authors have addressed problems with the GL index. Nilsson (1997) presented two major problems with the measurement of IIT. The first is the inappropriate grouping of industry activities. He proposed an alternative measure, indicating that the volume of intra-industry trade between two countries r and s may be divided with the total number of products they trade with each other to yield a measure of the average level of intra-industry trade per product group. Further, a dynamic GL index was suggested by Brülhart (2009) based on the concept of marginal IIT to address the problem of changes in the trade flows. The notion of spatial production cycles can be considered as a reworking of the ideas of feedback loops into a form that is compatible with the vertical specialization of production proposed by Hummels et al. (1998). Further details may be found in Sonis et al. (2002); the graphical structure is presented in the right hand side of Fig. 4. The methodology exploits the properties of block-permutation matrices that enable the identification of hierarchies of spatial production cycles. For the Midwest US application, the analysis was conducted at three levels: at an aggregated level in which all sectors were collapsed into one; at the level of three sectors (primary, secondary and tertiary); and at a six-sector level into which the previous three sectors were each divided into two. Table 2 shows the geographical division of the trade between the Midwest States in 1992. From this table, it is easy to calculate that the global intensity of trade in the Midwest in 1992 reached $3.9 trillion, while the interregional trade was $894.9 million, which is 22.2% of all US trade. 85.5% of Midwest interregional trade includes export and import with the Rest of US; the remaining 15% that flows among the Midwest states amounts to $135 billion. (If flows to final demand accounts were included, the total Midwest interstate flow would be of the order of $350–400 billion.) Without a detailed analysis of this table, it would be difficult to identify and interpret the dominant interregional and inter-activities linkages. This is accomplished in the following tables. On the most aggregated regional level of analysis, there is the decomposition of the Midwest trade flows into five feedback loops hierarchically ordered according to the intensity (sum of flows) of trade through this loop. Table 3 presents the two largest feedback loops connecting all the states of Midwest and the Rest of US. The larger of the two includes 25.9% of all interregional trade. It includes the largest export flow, from Illinois to the Rest of US, and the largest import flow, from the Rest of US to Michigan. The second of these two feedback loops accounts for 23.3% of all interregional trade, and includes the largest inner Midwest trade flow, from Ohio to Michigan. It is important to note that the spatial structure of these two loops is topologically identical; they differ only in the direction of flows. This means that the Midwest economy is well developed and bilaterally balanced: to each flow, there corresponds the equivalent counter-flow. These two feedback loops together account for 49.2% of all Midwest interregional trade. They characterize the multilateral trade connections between all Midwest states. Some further amplification can be provided; these two multilateral feedback loops together can be presented with the help of another pair of feedback loops including only bilateral trade connections. A more detailed analysis of the structure of industry-based spatial production cycles can be found in Sonis et al. (2002). Finally, the relation between international and interregional trade is important. The promotion of first US-Canada Free Trade Agreement (FTA), and then NAFTA (including also Mexico), was based on the premise that an enlarged market would provide mutual benefits to participant countries. Almost all the analysis and the presentation of the outcomes were considered at the national level; but what of the spatial impacts? Using a multiregional computable general equilibrium model, Gazel et al. (1996) estimated the regional (state-level) impacts of the US-Canada FTA to be of the order of 1–2% in the Midwest states (which had the greatest volume of trade with Canada) and up to 5% in states like Texas with more modest levels of trade. The analysis revealed that the relative regional gains from the FTA depend on factors other than export and import share of each region with Canada and their respective economic size. As Gazel et al. (1996) noted, the internal economic structure and the nature and volume of interregional trade played an important role in determining the outcome of the regional gains from trade. The spatial impacts of NAFTA turn out to be much more complex; one major structural change generated by this trade agreement was the significant spatial restructuring of the supply chains of many automobile companies. As a result, the sectoral impacts were often much more varied than the spatial impacts. Andresen (2009) measured the impacts of NAFTA on Canadian provinces and found that the impact on inter-provincial trade was more important than province-US trade; once again, the larger impact was on within-country trade. The US results were mixed; model specifications often fail to capture complex interplay between national and interregional trade, assuming somehow that the two are not connected. Further, the impact of international trade changes on interregional trade is often significant and spatially concentrated (Hewings and Parr 2009). Table 4 provides an analysis of interregional trade focusing on the Midwest and the Rest of the US for three selected years. First, the proportion of intraregional flows (those circulating within the Midwest or the Rest of the US) declined over the two decades of the analysis, even while total flows increased. Secondly, intra-industry flows increased while interindustry flows decreased. Interregional flows accounted for an increasing share of total flows with, once again, intra-industry flows increasing and interindustry flows decreasing. Flows within the Midwest but between different states increased as did trade between the Midwest and the Rest of the US (in both directions). Table 5 provides as assessment of the way in which changes in international trade differentially impact regions. Even though the macro structures of the states of Indiana (IN), Michigan (MI), Ohio (OH) and Wisconsin (WI) are similar, a change in international demand will generate different impacts – both internally and externally. Wisconsin is far more open – only 20% of the indirect effects of a unit change in international trade from this state remain within the state, 17.2% leaks out to the other Midwest states, and the remainder (51.9%) to the Rest of the US. In contrast, Michigan retains about 30.9% of the indirect effects, but almost an equal percentage (28.9%) spills over to the other Midwest states, and only 34% finds it way to the Rest of the US. Ohio is the least “generous” with other states, retaining over 50% of the indirect effects within its borders. The strength of these interstate connections in the Midwest – in 1993 over 40% of each constituent state’s imports and exports were derived from or destined for other Midwest states – means that changes in international trade will have a significantly concentrated effect. A similar analysis with Spanish regions (Llano et al. 2010) revealed that while domestic (intra- and interregional) trade flows dominated, international imports and exports grew at much faster rates between 1995 and 2005; a period within which Spain became increasingly integrated into the European Union. There is a continuing debate about the related so-called border effect in dampening trade flows. When considering intra-national trade flows, the question has been posed as to whether state borders have an impact that is comparable to that of national borders. Hillberry and Hummels (2003, 2008) have explored some aspects of this problem. Taking as a challenge that state borders apparently impeded trade flows, they revealed that much of the apparent limitation on interstate flows could be explained by the dominance of wholesaling activity which, by its very nature, was focused on local markets (Hillberry and Hummels 2003). With greater access to individual establishment-level data, a more extensive analysis was conducted to examine the degree to which trade responded to geographic frictions (Hillberry and Hummels 2008). In addition, they complemented the earlier work by decomposing trade into extensive margins (the number of commodities involved) as opposed to intensive margins (the value per commodity). Having access to actual trade flows (with precise distances up to a tolerance of 4 miles) from individual establishments, they were able to show that spatial frictions reduce the extensive margins, and that the so-called “home bias” was an artifact of geographic aggregation. Among other findings, they found that value declined very rapidly with distance, “…dropping off almost an entire order of magnitude between one and 200 miles, and is nearly flat thereafter” (Hillberry and Hummels 2008, p. 533). Further, the number of unique shipments drops at about the same rate as value over distance but value per shipment had no clear decline with distance. In essence, they conclude that spatial frictions have their greatest impact on the number of shipments rather than on the value per shipment. Shipments within a 5-digit zip code (about a four mile radius of the shipper) are three times higher than those outside the zip code; if the results had been estimated at a 3-digit (more extensive spatial unit) level, then intra-state flows dominate. However, it is not clear how these spatial frictions manifest themselves since the nature of state barriers vis a vis national ones are several orders less intrusive. In addition, the limitations in the number of goods exported/imported may be attributed to the lack of demand and thus to variations in economic structure. One further interesting finding from their work is that even at the five-digit level, intra-industry trade occurs – further verifying that the Jones and Kierzkowski (2005) ideas even operate at very small spatial scales. The analysis presented in this chapter has drawn from research that has examined gross trade flows. Increasingly, research is now focusing on trade in value-added. For example, the completion of the World Input-Output Database (www.wiod.org) in 2012 enabled analysis that revealed that EU’s trade deficit with China was 36% smaller when the value of the separate stages of production was summed independently rather than focusing on the value of the end products shipped. Applications of such methodology at the regional level would provide the potential for some reconsideration of the nature of trade flows. Further, the new approach might rekindle interest in Thirlwall’s (1980) proposition that regional problems are balance of payments problems, an issue recently re-explored by Ramos (2007). In addition, a related avenue of exploration is the degree to which trade in people (migration) and trade in goods and services are linked. Several studies have been directed at the impact that immigrants might have on opening markets between their current and former countries; in this sense, the role of interregional trade may also play a synergetic role in interregional migration flows. Earlier analysis of regional policies promoting greater diversification of state and local economies, as opposed to exploiting existing competitive advantages, now have to be extended to the portfolio of export and import dependencies. Traditional cluster-based development strategies are now being challenged by the increasing hollowing out of regional economies and the continuing fragmentation of production. Simple dyadic trade exchange has been replaced by complex flows; the final origin for an import or the final destination of an export from any given region may hide the chains of interaction that contributed to the assembly of the import and the ultimate destination of the export may be many further product transformations away and these transformations may occur in more than one location. Unraveling these complexities will require detailed databases and careful integration with other sources of information. While input-output and trade tables provide information on flows between sectors and countries, they reveal little about the ordering or sequencing of trade flows. Issues of risk and vulnerability will come to assume a more critical role as notions of dependency and interdependency are further elaborated and modified to account for much more extensive considerations of trade and its role in economic growth and development.